We have some great results to report from this past weekend! Kyrsten Sinema raced the Boulder 70.3 and clocked an impressive 5:55 which was a new 70.3 PR for her! Frank Smith kept his marathon streak alive with a 5:12 finish at the Drake Well Marathon in PA. This was good enough for 11th in his AG. Joan McGue braved the heat and raced a local 5K in 31:25 and took 3rd in her AG! 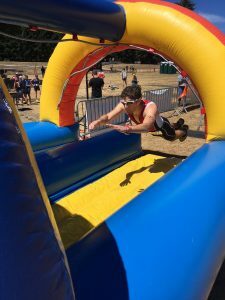 A bit further north, Brian Toncray raced the Portland Xterra in Oregon (featuring a slip and slide at the finish!) and placed 1st in his AG with a time of 3:10! Good luck to David Hay who is racing in the USAT Sprint Tri National Championships this weekend in Cleveland! This entry was posted in Results on August 9, 2018 by tekgrl_admin.